1- On "Publish" button on the top toolbar. 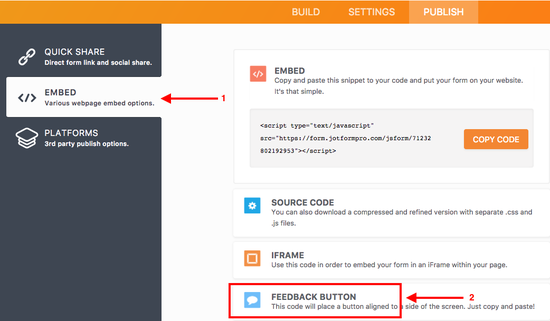 2- Click on "Embed" and then select "Feedback Button" option. 3- Copy the code given from the opened menu. 4- Open Joomla Administrator Menu, select "Template Manager" under "Extension" from the top menu. 5- Select your default template and click on "Edit" button. 6- Click on "Edit HTML" button. 7- Paste the copied code from JotForm between the head tags. 8- If you use Joomla template method to display header information in your template ( "" ), Mootool files comes with Joomla 1.5. In some browsers this can conflict with Prototype.js. To remove Mootools library paste the below code just above the header tag "". 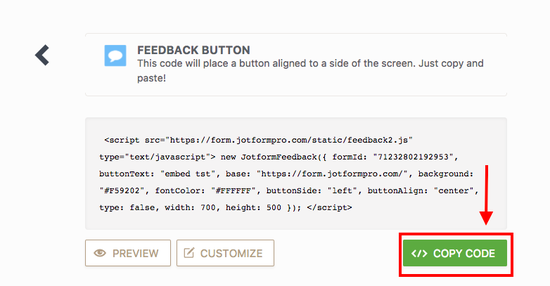 9- Save the template and you will see the Feedback button on the site. Haw con you install ? Thanks. It is a very great support offered. 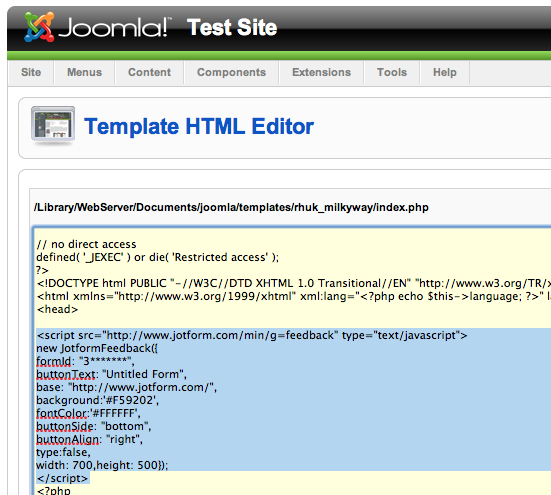 This doesn't work for joomla 2.5 any solution for that? Many thanks for this superb form builder. Also you can create a new module and paste the embeded code as script, then enable the module and choose position it works fine! Thnx so much, this really helped me!